This past New Year's Eve (yes, I realize that was over 8 months ago), my husband and I went over to my friend's parents' house in Georgetown, DC for a small gathering. They host something every year, and it's complete with private chefs, a band/singer, karaoke, a stocked bar and tons of great company. The chefs made everything from lobster to shrimp to filet mignon to salads to chicken. 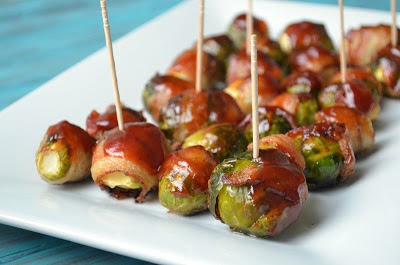 They also made BBQ Bacon Wrapped Brussels Sprouts. I had never seen such a thing or even heard of the idea, but I tried one and they were fantastic. Looking at some pictures the other day, I was reminded of them and wanted to give them a go myself. These are fantastic. 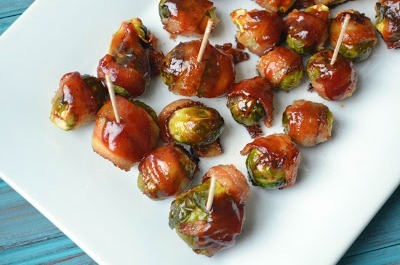 The Brussels sprouts become very tender, while the bacon becomes extra crispy. The hint of BBQ sauce finishes them off with some crazy flavors. These are great for an appetizer or side dish. Enjoy! Cut the bacon in half lengthwise. Depending on the size of your Brussels sprouts, cut the bacon in strips in half (for larger ones) or in thirds (for smaller ones). 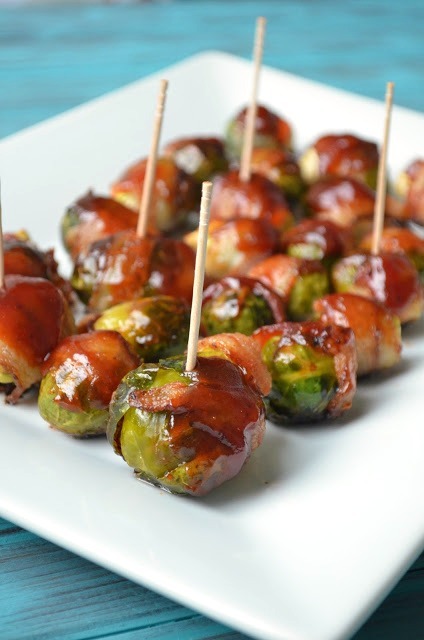 Wrap each Brussels sprout with a slice of bacon. Either secure with a toothpick, or place on the baking sheet seam side down. Bake for 25 minutes or until the bacon is crisp. 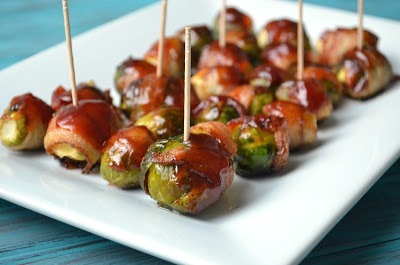 Remove from oven and spread each Brussels sprout with BBQ sauce. Place back in the oven for 5 minutes. Awesome! My hubby and I have recently discovered how much we love brussel sprouts. We've been looking for new ways to prepare them. Can't wait to give this a try! Love the bbq sauce over the bacon! Thanks for linking up with What's Cookin' Wednesday! will this work with frozen brussel sprouts? I haven't tried myself, so I can't say for sure. It could possibly work if you allow the Brussels Sprouts to defrost first. Otherwise, the bacon might get overcooked since you would have to cook frozen ones longer.